Friday, August 24, Philippine weather expert said, "Typhoon "JULIAN " was located at 1,040 km East of Basco, Batanes." and "Typhoon "IGME" was located at 220 km North Northwest of Basco, Batanes, based on satellite and surface data." PAGASA said, "Typhoon (Bagyong) JULIAN has maintained its strength as it moves in a northwestward direction." Public storm warning signal no. 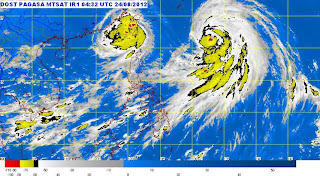 2 remained in the province of Batanes Group of Islands while Calayan and Babuyan Islands remained under Storm Signal No. 1. Meanwhile, PAGASA said Bagyong Julian (international codename Bolaven) maintained its strength as of 11 a.m. and Typhoon Igme is forecast to make a loop back motion within the next 24 to 48 hours. Comments or suggestions about "Typhoon (Bagyong) Julian Update August 24, 2012" is important to us, you may share it by using the comment box below.